Nintendo made some questionable decisions during the early 2000’s, but developing the WaveBird certainly wasn’t one of them. Years before wireless controllers were the standard on home game consoles, the WaveBird gave GameCube owners a glimpse into the future. It managed to deliver lag-free gaming without resorting to easily-blocked infrared, and had a battery life and range long enough that there was really no downside to cutting the cord aside from the lack of rumble support. In fact, the WaveBird was such a good controller that some fans just can’t put the thing down even in 2019. [Bill Paxton] loves his so much that he decided to modify it so he could use it on Nintendo’s latest money printing machine, the Switch, without having to fiddle with any adapters. While he was at it, he decided to fix the only serious drawback of the controller and hack in some rumble motors; arguably making his re-imagined WaveBird superior in just about every way to the original. It might be counter-intuitive, but the trick here is that [Bill] actually took the internals from a standard wired GameCube controller and fitted it all into the case for the WaveBird. That’s how he got the rumble support back, but where does the signature wireless capability come from? For that, he took apart a “GBros. Wireless Adapter” from 8BitDo. This gadget is intended to let you use your existing GameCube controllers on the Switch wirelessly, so all he had to do was shove its PCB inside the controller and wire it directly to the pads on the controller’s board. Thankfully, the WaveBird was rather husky to begin with, so there’s enough space inside to add all the extra hardware without much fuss. Between modifications like this and efforts to reverse engineer the controller’s wireless protocol, hackers aren’t about to let this revolutionary accessory go gently into that good night. You might see a GameCube slaughtered for a meme, but WaveBirds never die. The Nintendo GameCube was the first console from Big N with disc-based media. Gone were the cartridges that were absurdly expensive to manufacture. In theory games could be cheaper (yeah, right), and would hold more textures, pictures, and video. Around the time the GameCube hit shelves, your basic home computer started getting DVD burners, and you could walk into Circuit City and buy those tiny little DVD-Rs. But you couldn’t do it. You couldn’t burn GameCube games, at least without advanced soldering skills. One company did. Datel, a British company that produced the Action Replay, the ‘Game Genie of the GameCube’ figured out how to get around the GameCube’s disc protection. Not only that, but in a decade and a half since the Action Replay came to market, no one has managed to copy their methods. In a fascinating video, [Nathan] takes us around the disc to see how this disc protection scheme actually worked, and how to exploit it to load homebrew games from an SD card. The Nintendo GameCube disc format is almost, but not quite, the same as a DVD format. On (nearly) every DVD, and almost every GameCube disc, there’s a ‘barcode’ of sorts on the inside of the optical tracks. This burst cutting area (BCA) is unique to every copy that comes off a single master. Additionally, this BCA can only be cut with a YAG laser that’s significantly more powerful than the laser diode in a DVD writer. But the Action Replay disc from Datel didn’t have this BCA. Why not? The BCA effectively writes over the pits and lands in the first blocks of data in a DVD. Since the BCA is written over data that is already there, you can just encode whatever data the BCA should hold into the raw data of the pits and lands. It’s a brilliant technique that allows consumer equipment to create the Action Replay disc. But surprisingly, this technique wasn’t popularized with the GameCube homebrew scene. Not that it really mattered, anyway; modchips existed, and with the SD to Memory Card adapter you could run homebrew works without having to burn a disc. That’s exactly what [Nathan] did with his GameCube setup, you can check out the video below. A few months ago, [Shank] built what will almost certainly go down in history as the world’s smallest portable Nintendo Wii. As it turns out, the Wii motherboard is home to a lot of unnecessary hardware, and with a careful hand and an eye for detail, it’s possible to physically cut it down to a much smaller unit; allowing this particularly tenacious hacker to put an actual Wii, along with everything else required to make it portable, into an Altoids tin. As you might expect, between the cramped controls, comically short battery life, and the fact that the whole thing got hot to the touch during use, it was a miserable excuse for a portable console. But the incredible response the project received inspired [Shank] to dust off an earlier project: a far more practical portable Wii that he calls PiiWii. This time around the handheld is a more reasonable size, a useful battery life, and proper controls. It even has an integrated “Sensor Bar” so you can use real Wii Remotes with it. It might not be the prettiest portable console conversion we’ve ever seen, but it certainly ranks up there as one of the most complete. 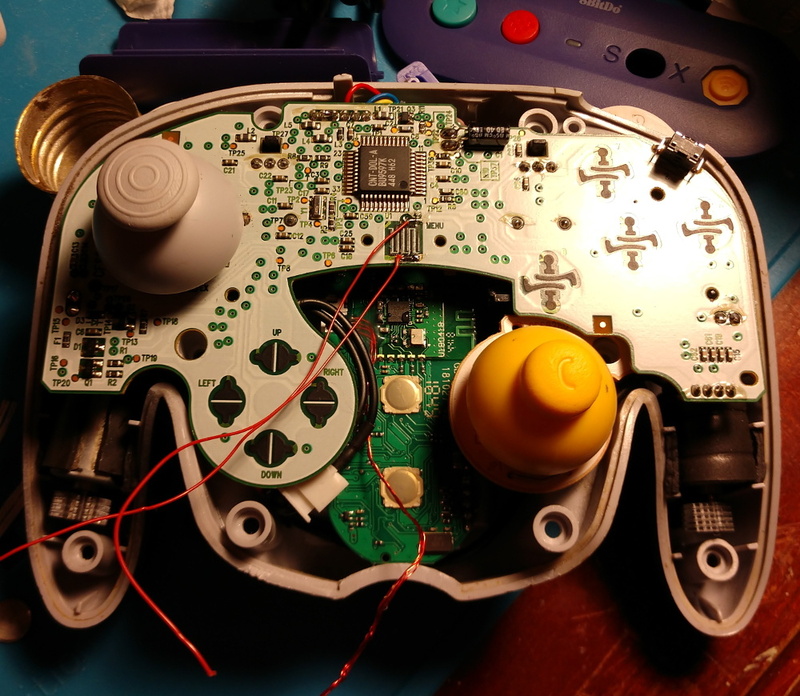 [Shank] actually “finished” the PiiWii some time ago, but in his rush to complete the project he got a little overzealous with the hot glue and ended up with a device that was difficult to diagnose and fix when things started to go wrong. He shelved the project and moved on to his Altoids tin build, which helped him refine his Wii shrinking skills. With a clearer head and some more practical experience under his belt, the PiiWii was revamped and is clearly all the better for it. Unlike previous Wii portables we’ve seen, there’s no attempt at adding GameCube controller ports or video out capability. It’s built to be a purely handheld system, and that focus has delivered a system that’s roughly the size of the original Game Boy Advance. Beyond the cleverly sliced Wii motherboard, the inside of the PiiWii features a 3.5 inch display, a custom designed audio amplifier PCB, four 3400 mAh cells which deliver a run time of around four hours, a 3DS “slider” analog stick, and a generous helping of Kapton tape in place of hot glue. If there’s any criticism of the PiiWii, it’s likely going to be about the system’s boxy exterior. But as [Shank] explains, there’s an excellent reason for that: it’s literally built into a project box. He simply took a commercially available ABS project box, the Polycase SL 57, and made all his openings on the front with a laser cutter. Other than the fact taking a laser to ABS releases hydrogen cyanide, he found it a good way to quickly knock out a custom enclosure. Last year we took a look his ridiculously small Altoids tin Wii, and while that was an impressive project to be sure, we’re glad he revisited the PiiWii and showed that a portable Wii can be more than just a novelty. Compared to other systems, the Wii doesn’t seem to get the portable treatment that often, so we’re always glad to see somebody come in and do the concept justice. [James] has been working with GameCubes, emulators, and Animal Crossing for a while now, and while emulators are sufficient, he’d like to play on real hardware. This means he needs to write to a GameCube memory card. While there are a few options to do this, they either require a Wii or hardware that hasn’t been made in a decade. The obvious solution to this problem is to reverse engineer the GameCube memory card to read and write the memory with a Raspberry Pi. 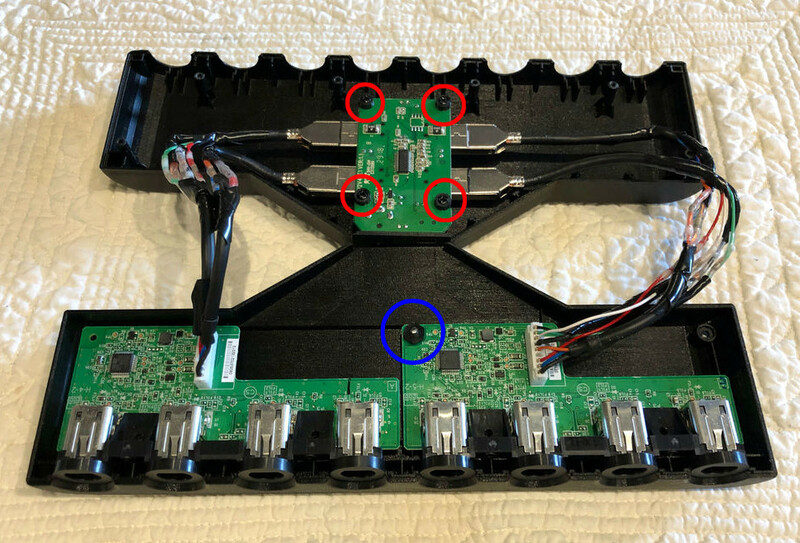 There’s an incredible amount of unofficial documentation for every console, and [James] stumbled upon a GC-Forever forum post that describes the electrical signals inside the GameCube memory card. There’s your standard compliment of power and ground pads, along with a DI, DO, CS, Clk, and an INT pin. [James] broke out the magnet wire and soldered up a pin header to these cards. Data was then captured with a Salae logic analyzer, and lo and behold, it looked like a standard SPI protocol. With the low-level protocol worked out, [James] checked out the Yet Another GameCube Documentation to get the main functions allowed through the SPI bus. The ‘read block’, for instance, starts off with 0x52 and an address offset. A little bit of Python on a Raspberry Pi meant [James] could read and write the entire GameCube memory card. Right now the code is a little rough, but all the work is available should you want to edit your Animal Crossing save with a Raspberry Pi. This work follows [James]’ earlier work on getting into the debug menu of Animal Crossing, allowing him to add items to his inventory. With this latest advancement, it’s only a matter of time before we plug Raspberry Pis directly into a GameCube. With the release of Smash Ultimate fast approaching for the Nintendo Switch, [Patrick Hess] wanted to get ahead of the game and make sure his squad had the equipment they’d need. Namely, support for the GameCube controllers that serious Smash Bros players demand. But it wasn’t enough to have one or two of them hooked up, or even four. Not even six GameCube controllers could satiate his desire. No, he needed to have support for eight simultaneous GameCube controllers, and he wanted to look good doing it too. Enter his meticulously designed eight player GameCube to USB adapter. Made out of dual official Nintendo GameCube to USB adapters (intended for the Wii U) merged together in a 3D printed case, the final result looks like something that could earn the coveted Nintendo Seal of Approval. Or at least, something that might pop up on the import sites in the next month or two for a few bucks. [Patrick] started the project by recreating the official adapter PCBs and their housings in 3D using a pair of calipers. After a couple of test prints to make sure he had all the dimensions right, he could then move on to designing his final enclosure knowing he had accurate data to model around. In addition to the two adapter boards, there’s also a four port USB hub inside the device’s case. Each adapter has two USB leads, here shortened to fit inside the case, which connect up to the hub. The integrated hub allows connecting all eight GameCube controllers through only a single USB connection. All controllers worked as expected during intense testing on the Wii U’s version of Smash Bros, though at this point [Patrick] can only assume it will work when the Switch version is released. 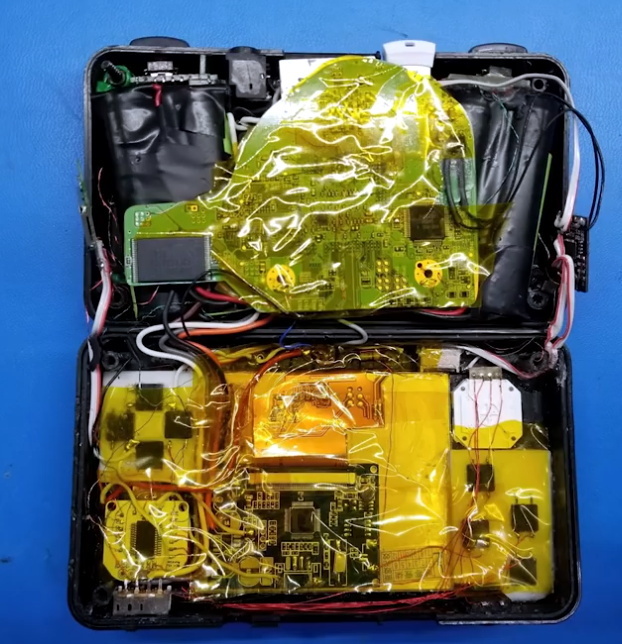 If there’s a downside to this project, it’s that the design for the 3D printed case is so intricate that [Patrick] was only able to print it on a machine that supported water-soluble PVA supports. A somewhat tall order for the average hacker; it would be interesting to see if somebody could make a second pass on the enclosure that is geared more towards printability than aesthetics. While the design of the GameCube controller remains somewhat controversial after all these years, there’s no denying it retains an impressive following. Whether turning them into USB devices, shrinking them to preposterously small dimensions, or just finding increasingly creative ways to use them on Nintendo’s latest console, hackers are definitely in love with the gonzo little controller that’s now pushing 20 years old. There are a lot of good reasons to think fondly of the Nintendo GameCube. Metroid Prime and Rogue Leader knocked it out of the park. The Game Boy Player was cool. There’s even something to be said for having a convenient carrying handle on a system designed for couch multiplayer. But if you ask anyone who played Nintendo’s sixth generation console what part they missed the least, it would probably be the controller. With all the visual flair of a Little Tikes playset and ergonomics designed for an octopus, it’s a controller that works well for first-party Nintendo titles and little else. So it’s probably for the best that these Switch Joy-Cons created by [Madmorda] focus on recreating the aesthetics of the GameCube controller for Nintendo’s latest money-printing machine rather than its feel. With a surprising amount of work required to create them, these definitely count as a labor of love by someone who yearns for the days when gaming was more…cubic. To start with, nobody makes Joy-Con cases in that signature GameCube purple so [Madmorda] had to paint them herself. The longevity of a painted controller is somewhat debatable, but the finish certainly looks fantastic right now. For the left analog stick [Madmorda] was able to use the cap from a real GameCube controller, which fit perfectly. Apparently, Nintendo has been pretty happy with their analog stick sizing decisions for the last two decades or so. The right analog stick was another story, however, and she had to cut the shaft down to size with a Dremel to get the cap to fit. 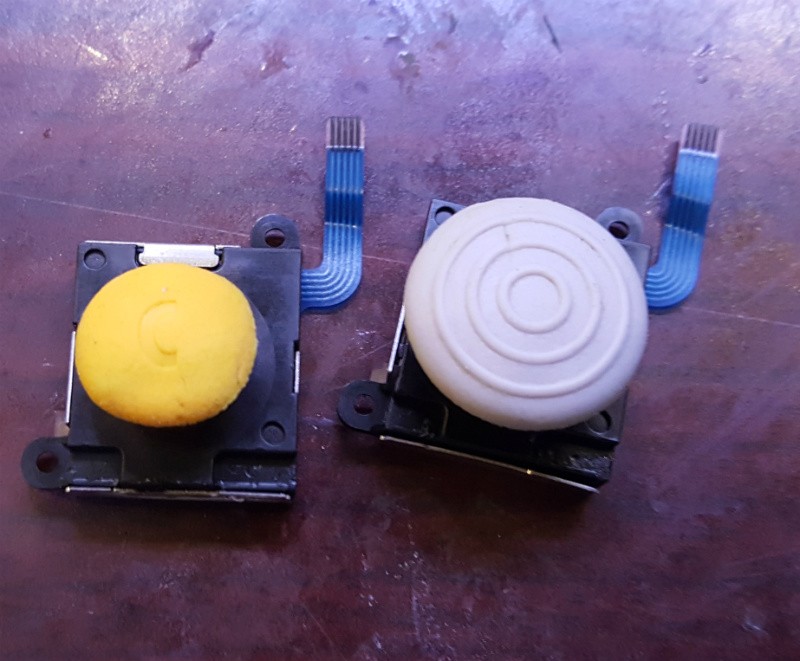 Finally, molds were made of the original face buttons, which were then used to cast new buttons with colored resin to match the GameCube color scheme. Since the original Switch buttons don’t have indented lettering to get picked up by the mold, she had to laser etch them. This little detail goes a long way to selling the overall look. The final result looks great, and compared to previous attempts we’ve seen to bring some of that early 2000’s Nintendo style to the Switch, this one is certainly less destructive. Check them out in action after the break!